Tafadzwa Nyamuzihwa, founder of the organization, grew up in an orphanage since the age of one. He attained primary and secondary education in Harare, Zimbabwe, and went to study in South Africa towards a Diploma in Sports Management in 2006. Tafadzwa, at the age of 25, became totally blind in 2009 due to a retinal detachment that resulted from cataracts. Consequently, he found life tough and felt his window to the world had been shattered. As a Christian, he never gave up on the Lord and he received grace and strength. He went for rehabilitation in unaided mobility and braille in 2010 and proceeded to obtain a Certificate in Counselling from Connect Zimbabwe. Later that year, he featured in a local national television drama series that ran from September 15, 2010 to March, 2011. In the same year, he received a one-year scholarship to study at the International Institute for Social Entrepreneurs in Trivandrum, Kerala, India (Southern India) in 2011. Through such opportunities availed to him, he embarked on a path to change the lives of blind people in Zimbabwe. He was a delegate at the UN African Youth Conference in Nairobi, Kenya in December 2012. In 2014, Tafadzwa was amongst the Mandela Washington Fellowship for Young African Leaders. He was at Northwestern University, Illinois, Chicago, USA, where he was studying Business and Entrepreneurship. His highlight was when he attended a 3 day presidential summit where he shook hands with President of the United States of America Barack Obama and first lady Michelle Obama in Washington DC. 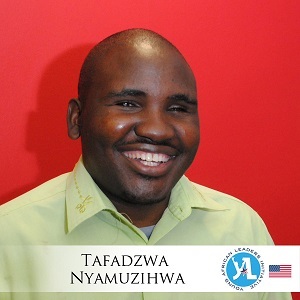 The Junior Chamber International (JCI) awarded Tafadzwa in the 2015 Top 10 outstanding young Zimbabweans for his Humanitarian and voluntary work he has done with people with disabilities. Summary: Tafadzwa ‘s answer to the five questions! Listen to the full conversation on the player above; also available on iTunes, Stitcher and Soundcloud. My definition of hope is looking to the future. It’s building today in order for the future. When you see something into the future and are hopeful about it, that is the one that’s giving you hope to get there. My favorite quote about hope is “I’d rather not have sight than have sight without a vision” from Helen Keller. First is the founder of Econet Wireless in Zimbabwe, Strive Masiyiwa. He’s given me hope because he had to fight to get a telecommunications license for 10 years. He could have given it up the first year but he had to work on it for 10 years before he got it. He believed in it and he believed in that vision. He never gave up the fight until he got what he wanted. The next is Oprah Winfrey. She’s an African-American woman who has done amazing things in the world. I like the way she articulates hope and I like the way she just makes you stand up tall and believe in yourself and not to depend on anybody. My fiancé. The reason why she gave me hope is – one of the things that happen in the African context is to someone with disability, it’s not always easy to have someone who is able-bodied to teach you or to marry you. She’s so beautiful and she loves me for who I am and she has taught me to be a better person. She gives me the self-confidence and hope. There’s a bridge between the sighted world and the blind world. When I had to cross the bridge from not having a disability into having a disability, that was one of the toughest bridges I’ve ever walked in my life. I felt that I’ve lost my dignity. I felt like I’ve lost everything. I never believed in myself and I thought the best thing I need to do is to commit suicide and give up in life. When I think about Strive Masiyiwa and Oprah Winfrey (at that time I was not yet dating my fiancé), I think wow, if these two people made it, I can also make it. I can always stand up strong and be able to realize that bridge. One of my pastors from my church came to me and said “Tafadzwa never do anything out of desperation. When you do something out of desperation, you’re about to make the wrong decision.” For me, that was a powerful quote. I also realized that when there is a problem, what solves the problem is a solution. You need to come up with a solution that will solve the problem. In every situation that I find myself in, I look first for the solution. If I have the solution, then it is easier for me to tackle the problem. This is how I’ve been able to overcome all the bridges where I’ve lost hope. I believe my purpose on this earth is to impact the world. My purpose is to change lives. It’s to give someone hope and inspire them and make them realize their destiny in life. What I do today is I set up an organization Shine On International Trust. This organization is to create a society where the blind are empowered with independent living. We’re training the blind how to use ICTs. I find that technology is something that can bridge the gap between the able-bodied and the blind. We train the blind on how to use technology – how to find opportunities, how to find jobs, how to access education, resources, information using technology. We’re also training the blind on sporting programs. Why sports? It answers independence and reduces fear in one. It always brings inclusiveness, it enhances independence, it removes issues of fear within oneself. We also touch information on HIV and AIDS. A lot of information has never been in Braille. People who are blind have been deprived of living a healthy and independent lifestyle. They cannot protect themselves. They also need information. They also need to live a healthy lifestyle. We are also advocating for people with disabilities to be able to access education, be empowered. Access health services, access everybody, and access everything just like everybody. I’m doing a part-time radio voluntary program in Star FM in Zimbabwe. The basic vision of the show is we want to celebrate people who have defied the odds. We want those zero to hero stories – people who have been down and have picked themselves up and have given hope to somebody else. Another thing I do is I go out to communities and I give motivational talks to the less privileged, to vulnerable groups just giving them that hope. Look at me, I grew up in an orphanage and now I’m totally blind, but because I never felt pity on myself and because I believed in myself, this is what I’ve been able to do. (1) When there’s a problem, you need to come up with a solution for yourself. (2) Ask yourself what you can do with whatever around you.